Looking to write your memoirs in Hinsdale? Milestones, the Gift of a Lifetime can help. If like other Hinsdale residents who want to writer their life story and don’t know how to begin, Bonnie Bell, founder of Milestones, the Gift of a Lifetime, will assist you in a series of recorded conversations in your Hinsdale home. Today the most treasured gift you can give loved ones isn’t your wealth; it is the story about your life and family history. Autobiographies and memoirs are the fastest- growing segment of the publishing industry. Just look at the new memoirs and biographies that line the shelves in Hinsdale bookstores or the Hinsdale Public Library. Whether you have built a family business or you want your children and grandchildren know who their ancestors and what it took for them to succeed Milestones, the Gift of a Lifetime preserves your words into a professionally edited account of your life. Bonnie Bell, MSJ, M.Ed,is a long-time North Shore resident and published journalist in such publications as Newsweek, Crain’s and Business Week. Skilled in the art of interviewing, she has more than 20 years experience in writing biographies as a correspondent for People Magazine. She knows how to weave a story! If you’ve been thinking about how to write your memoirs but couldn’t find a biography writer in Hinsdale, Milestones, the Gift of a Lifetime is recognized as a professional provider of memoir writing services. Milestones, the Gift of a Lifetime has been helping clients write their memoirs and autobiographies since 1999. 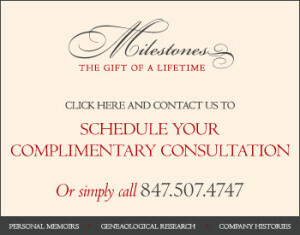 Find out more about Milestones, the Gift of a Lifetime and personal history writing in Hinsdale, IL 60521.